At the age of 13, Amara Stovall joined a High School program called CEOs of Tomorrow. The program helps students create businesses that solve social issues. She was able to be in the program with a little help from her grandmother. “Since I was ten, my grandma always knew I wanted to have my own business,” she said. I asked Amara what made her want to become an entrepreneur at such an early age. “I do not like to be told what to do. I am my own boss,” said Amara. Her and her grandma told her story to the program leaders, and they knew she had what it takes to be an exceptional entrepreneur. CEOs of Tomorrow made the right choice. She is the only middle schooler in a high school program. And she is excelling. In fact, Amara Stovall’s business already makes a profit. Amara’s business is called “Don’t Profile.” Don’t Profile focuses on survivors who have been through the pain and loss of police brutality. Part of her profit gets donated to various organizations, like the Black Lives Matter Movement. So far, she created two products: a black hoodie that says “Don’t Profile me because of my Hoodie” on the front and the back, and a royal blue t-shirt that says “Real People” on the front with hand cuffs, and family members on the back. “Starting next year in February, I will have a total of four products launched,” Amara said with excitement. After a ten-week long CEOs of Tomorrow program, she presented her business at the “pitch & launch” event, where she sold her apparel. At the end of the event, she made about $300 and publicly announced that 10 percent of her profit will go towards The Black Lives Matter Movement. A few weeks ago, after the event, she was asked by the founder & CEO of Tomorrow, Dr. Roxie Hentz to be in a planned business incubator, along with a few other students in her class. CEOs of Tomorrow ‘s motto is “Inspiring Kids Ideas for Better Community,” and she wants to continue to live by that motto. If you are interested in buying and supporting her business, contact: dontprofile@gmail.com. The article originally appeared in the Simpson Street Free Press. 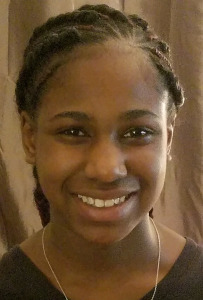 Amara Stovall is an eight-grade student at Wright Middle School and student writer at Simpson Street and Wright Free Press. Amara enjoys playing volleyball and is part of the Black Student Union at her school.